A North Dakota golf course is being damaged by a group of skunks that normally wouldn't be around under normal weather conditions. KVLY's Jennifer Titus reports. From the Dakotas to Oklahoma, city folks are more often seeing, and sometimes smelling, a varmint not much welcome in their parts. Skunks, it turns out, are showing up in more places these days, thanks to the drought covering most of the U.S. In South Dakota, the city of Aberdeen has set all its skunk traps and could use more -- if it had them. "It's been my life here for the last month or so," animal control officer John Weaver told AberdeenNews.com. Weaver normally catches two skunks a month, but over the last three weeks, he has already netted 13. "From everything people are telling me, and what I've discussed with other folks who are in the animal control business, it has to do with the drought," Weaver added. "Farmers are cutting things down, so the skunks are looking for food and water and are coming to town for that." A veterinarian urged residents to make sure pets are vaccinated, because skunks can carry rabies. "There isn't a monster invasion of rabid skunks or anything like that," said Tim Sahli. "It's just a concern, and if we stay on top of it, it won't be a problem." In North Dakota, a golf course that has seen greens damaged by skunks trapped 13 skunks in just one month -- using marshmallows as bait. "We thought we'd catch one or two and that would be about it," Hillcrest Municipal Golf Course Superintendent Marlyn Bertsch told ValleyNewsLive.com. "In the past we never really noticed any out here," he said of the course in Jamestown. "You could smell 'em every once in a while, but never had any damage." In Oklahoma, a self-styled "Skunk Whisperer" has been busy trying to rid backyards of skunks. Striped skunks like this one are native to much of the Midwest, where drought has made them much more visible. "They have three things that they want: food, water, shelter," Ned Breuha told NewsOn6.com. "And when they can't get one of those things, they go to greener pastures," like the backyards. "This is a green, green pasture," he said of the yard he was working in when interviewed. Breuha said some property owners try to trap the skunks themselves, then release them in other areas. One of those has been at Oklahoma City's Lake Hefner, where residents are complaining of a skunk spike. "I saw a skunk twice, two days apart ... leaving from my rose garden," said Arthur Bay, who has lived at the lake for 43 years and never before seen a skunk. "He's not welcome." Lake Hefner Golf Club was seeing about a dozen skunks every morning until it hired a trapper. "He trapped 60 skunks" over three weeks, said club employee Daniel Mills, "and we still have skunks." The Midwest was hit hard by the lack of rain this year, likely triggering an increase in food prices. WOWT's John Chapman reports. 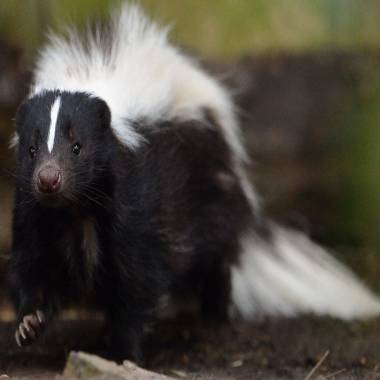 Anyone coming across an aggressive skunk should shoot it in the body so the head can be tested for rabies, South Dakota's state epidemiologist Lon Kightlinger told SiouxCityJournal.com. "We don’t want hunters just going out and blasting skunks, and we don’t want road kill," Kightlinger said.